This has been a rough week in our house, because apparently you have mastered the whole “object permanence” thing, and sleep has just not been happening. Thank goodness I have a ton of wonderful friends who have given me lots of great ideas to try out to get you sleeping again. Hopefully we will all be sleeping better soon. In the meantime, let’s talk about the FUN things that have happened this week. 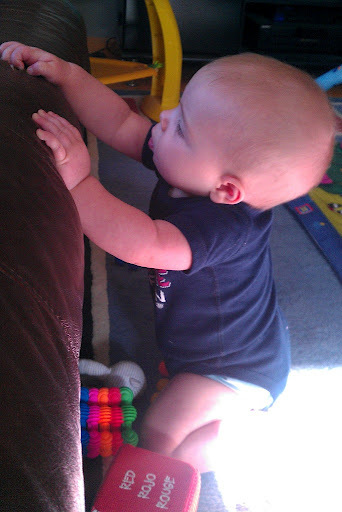 You continue to get closer and closer to crawling. Right now you can go from a seated position to a swan dive onto your belly to get toys AND THEN sit yourself back up! This is a major milestone baby – you used to get SO mad when you were stuck on your belly, but no longer! Solid foods continues to go well – you will try anything and everything that we give you (even lemons! ), though yesterday we gave you prunes (both a puree and a juice) to try to get things *ahem* moving for you, but no such luck. You hated the prunes, and nothing is moving yet. Poor baby. Other than that, BLW is awesome – everywhere we go, there are options of what to give you to eat, and I love that! Oh I love when Lexi reaches for me! Makes my heart melt as well – it is seriously one of the best things ever. 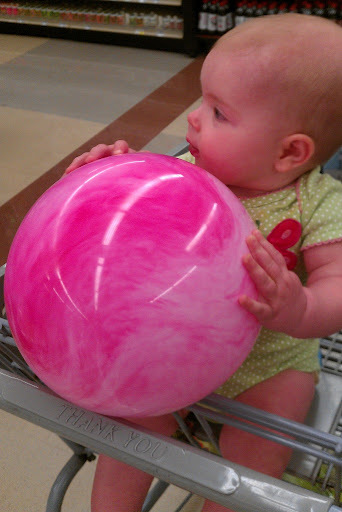 Love the picture of her in the cart with the ball – too cute!! so sweet, my little ones sit up so well but for some reason they dont care for the carts. They do well in the high chairs though. I love when the babies reach for me, it does truely melt your heart. How about plums, aren't prunes just dried plums? Wouldn't that help? SO adorable! I love her little blue and pink outfit! Hm, I bet she isn't too far from pulling up to her feet then. E pulled up to her knees one day and then the next she was standing in her crib. It was insane!C has constipation issues, the nurse said to give her prunes or white grape juice. C liked prunes so that helped. I hope things move along for her soon. She is getting so big. I can't believe she will be crawling soon. I'm with Michele – we do plums instead of prunes and it seems to do the trick. ;)Love the second picture. Posing in the natural light. So adorable.